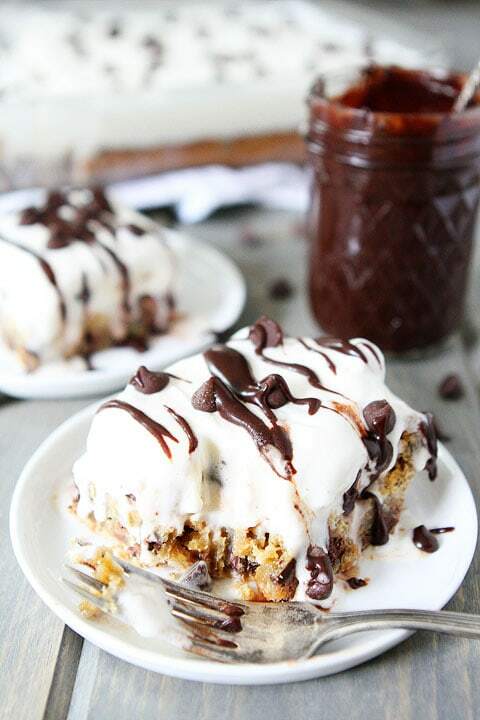 Chocolate Chip Cookie Ice Cream Bars-chocolate chip cookie bars topped with chocolate chip cookie dough ice cream. A drizzle of hot fudge is highly recommended! A few weeks ago I posted a recipe for Toffee Ice Cream Brownie Bars. I haven’t stopped thinking about them because I haven’t stopped eating them:) Well, I did take a break to make Chocolate Chip Cookie Ice Cream Bars. I had to see if the ice cream dessert would work with chocolate chip cookie bars. Did it work? You better believe it! I made my favorite chocolate chip cookie bar recipe and topped the bars with chocolate chip cookie dough ice cream. If you are a chocolate chip cookie fan, this is the dessert for you! I love making these ice cream bar desserts because you can make them in advance. You can keep a pan in the freezer and pull them out when you have company…or an ice cream craving! 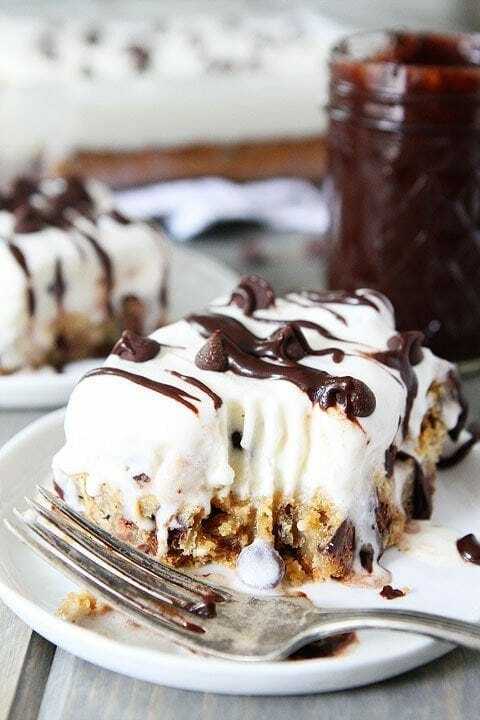 The thick and chewy chocolate chip cookie bars get frosted with chocolate chip cookie dough ice cream. The Cookie Monster would love this dessert! I like to cut the bars into squares and drizzle warm hot fudge over the top. Mmmm! You can also cut them into skinnier bars and eat them like an ice cream bar. Your fingers will get a little sticky, but that’s all part of the fun! I will warn you, like the Toffee Ice Cream Brownie Bars, these bars are hard to cut. Make sure you run a sharp knife under hot water when you are cutting the bars. You will get a workout cutting the bars and that means you can have two servings. Trust me, the work to get them out of the pan is worth it! 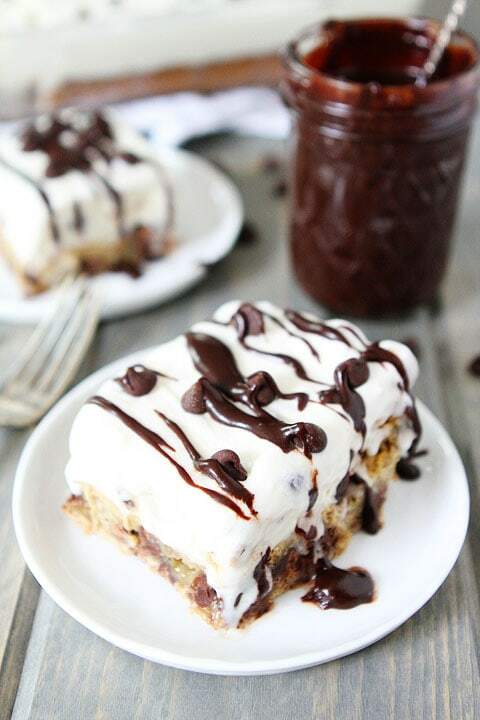 Celebrate summer with Chocolate Chip Cookie Ice Cream Bars! 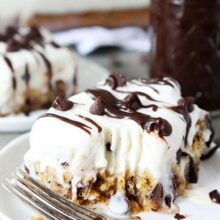 Cookie and ice cream lovers will be in dessert heaven with these decadent bars! 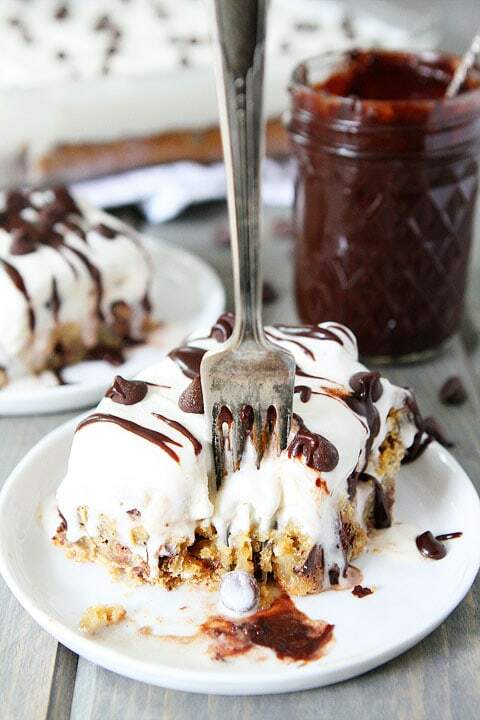 Chocolate chip cookie bars topped with chocolate chip cookie dough ice cream. The Cookie Monster gives this dessert two thumbs up! First, make the chocolate chip cookie bars. Preheat oven to 325 degrees F. Spray a 9x13-inch baking pan with nonstick cooking spray and set aside. Pour cookie dough into the prepared pan, smoothing the top with the spatula. Sprinkle cookie bars very lightly with sea salt, if desired. Bake cookie bars for 25-30 minutes or until the top of the bars are light golden brown and the edges start to pull away from the pan. Remove bars from oven and cool completely. When the cookie bars are completely cool, evenly spread the ice cream over the cookie bars. Garnish with chocolate chips. Cover the ice cream bars and place in the freezer. Freeze until ice cream hardens, at least 2 hours. This dessert can be made in advance. When ready to serve, remove the pan from the freezer. Run a sharp knife under hot water and cut the bars into squares. The bars will be hard to cut so make sure you get the knife super hot in between each cut. 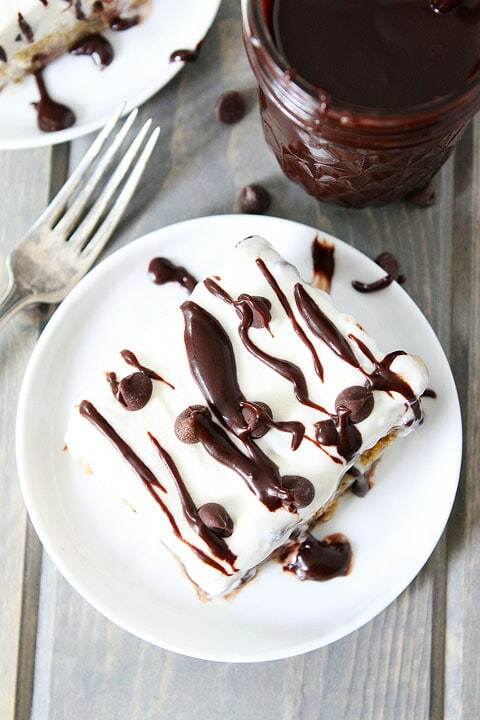 Drizzle the bars with hot fudge sauce, if desired. Serve. Note-To soften the ice cream, let the ice cream out on a countertop for 30 minutes before using. You want it soft enough to spread over cookie bars but still slightly frozen. The ice cream bars will be hard to eat with a fork if you eat them straight from the freezer. You can let them sit for a bit or you can pick them up and eat them. They are a little messy to eat, but I promise it is worth the mess! They look like the perfect summer treat – pinned! Great recipe! A good day having a treat like this with friends! These look incredible Maria. You are the ice cream bar queen! Oh yes! I cannot think of a better summer treat. Cookie with ice cream. I would take a second helping! I don’t know if I have enough self control to share these with anyone! They look so good. The drizzle of hot fudge should be mandatory! Kind of like, you have to go to school, you have to stop at stop signs, you must have that hot fudge, oh my. Save me from myself! Mmm what a perfect dessert for summer that the whole family will love! Um, these look amazing! Keep the ice cream desserts comin’! Pinned. What an amazing summer treat! Could you pre-cut the cookie bar before you cover with the ice cream? Might make cutting them easier? I haven’t tried pre-cutting the bars. You would still have to cut through the ice cream. Cutting them and then adding the ice cream might be messy. I have a feeling I will need two pans of these…one for me and one for company. I definitely need these bars!!! I love ice cream brownie bars but could I make a suggestion? To save yourself AND your knife; put foil in the pan, spray with Pam, and when brownies cool completely remove from the pan using the foil. Put brownies on the counter and cut them into squares. Return them to the pan, spread the ice cream on top and then freeze. To serve, remove from pan, turn upside down and cut through the already cut brownies and through the ice cream. Turn over and serve. MUCH easier! Your knife will thank you! WHOA! These look amazing, Maria! Do. Want. Now! Love the toffee ice cream brownie bars + I love these too! Looks amazing!! 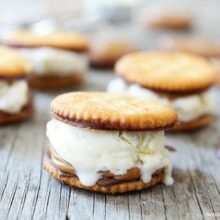 Definitely making these for a summer treat! Amazing, Sounds good and informative.. Thanks for this one.. !! What a great treat to keep in the freezer! I could eat this right through screen, as I’m an avid ice cream fan. You had me at Chocolate. Great summer dessert! So excited to see these! I don’t do toffee and was a bit jealous when I saw that recipe. I just ordered a square springform pan – I think I’ll try that with parchment lining to hopefully simplify the cutting process. These bars are decadence at its best. 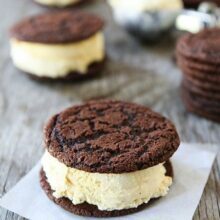 Who doesn’t crave cookies and ice cream in the summer?! Yum! You can’t go wrong with ice cream, cookies, and fudge! I recently made these for a party, and they were a huge hit! Fairly easy to make and super delicious! Thank you! I would make these in cupcake papers! Make as an individual dessert. Probably use the foil papers. Pingback: 20+ Ice Cream Treats! 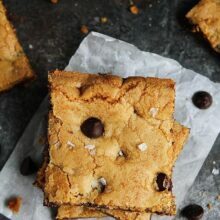 these look amazing I wish these cookie bars could just be delivered right to me! they look sound so perfect for dessert right now! I used heavenly hash ice cream. Delicious. 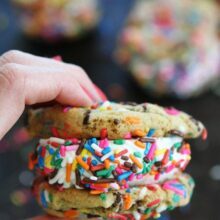 I would definitely make these for the kids or for a sweet snack! I love the idea!! how far ahead could these be made??? They can be made well in advance because you can keep them in the freezer.